The long fight over Do-Not-Track followed a predictable trajectory: a detailed, meaningful pro-privacy system was subverted by big business, and then published as a "standard" that offered virtually no privacy protections. Today, turning on the Do-Not-Track setting in your browser does virtually nothing (Medium and Pintrest offer some support, everyone else not so much). EFF's Privacy Badger blocks ads from companies that don't comply with Do-Not-Track, so running Privacy Badger is a way to give your browser settings some teeth. 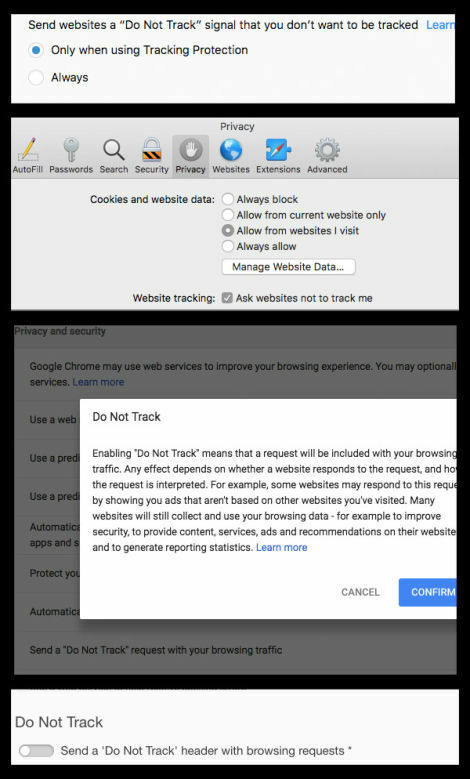 To demonstrate their theoretical support for DNT—or from a more skeptical perspective, to garner some positive press—Google, Microsoft, Apple, Mozilla, and others started offering the “Do Not Track” option in their respective browsers, but absent a consensus around the actions required in response to the DNT:1 signal, these browsers are just screaming for privacy into a void.